Pork chops are hardly a go-to meat for most people, but with the right recipes, they can be quite delicious and healthy. If there’s one cut of meat that gets a bad rap across the board, it’s the pork chop. Too many people have memories of overcooked pork that’s as flavorless as it is dry, and its higher fat content, compared to succulent pork tenderloin, give the chop a poor reputation for healthy cooking. There’s a case for adding pork chops back into your meal plan, however. They’re over 50% protein, and although they aren’t a lean meat by any means, it’s leaner than many red-meat options, and like other meats, is a good source of B vitamins, zinc, and magnesium. Here are 7 healthy ways to cook up the chop. Enjoy! 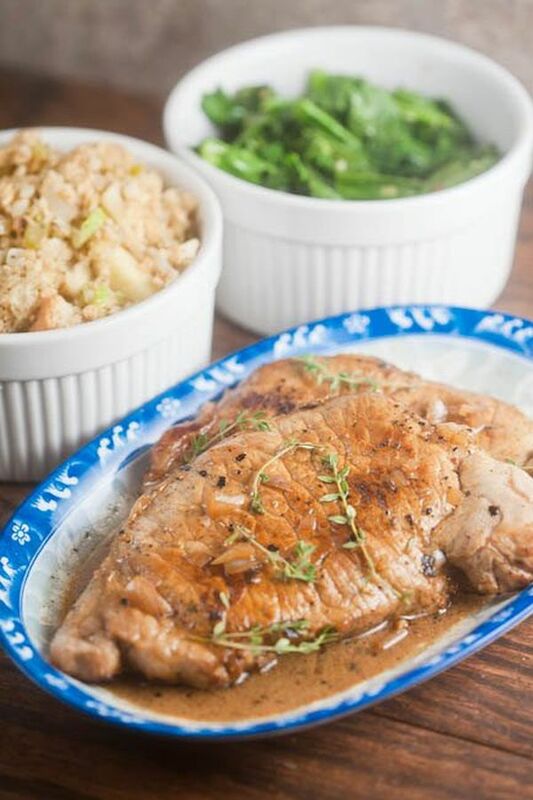 Gravy is a classic way to counteract the potential dry texture of pork, but this recipe offers a few other ways to ensure the meat is tender and juicy. 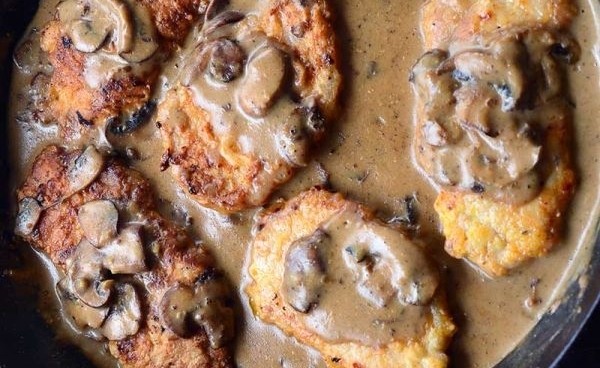 The chops are dredged and then seared on both sides to keep the moisture inside, and then finished in the oven and the smothered in a hearty mushroom sauce. 1. Preheat oven to a warm (low) setting. 2. Place pork chops in a zippered plastic bag. Seal it, and hit the pork chops with a meat mallet until 1/4” thick. 3. In a small bowl, beat the egg. In a separate bowl, combine flour and seasoning salt. 4. Remove pork chops from the plastic bag, dip in egg, and then dredge in flour to coat. Transfer to a plate, and let set for 15 minutes. 5. In a skillet, heat butter and olive oil over medium heat. Once the butter has melted, fry pork chops until browned and cooked through. About 3–4 minutes per side. Transfer to an ovenproof dish, and place in oven to keep warm. 6. Reserve a tablespoon of the pan drippings. Add mushrooms and cook until browned, about 5 minutes. Sprinkle 2 tablespoons of flour over the top, and stir. Cook for 1 minute. Whisk in broth and milk. Cook until thickened. Season to taste with salt and pepper. 7. Place cooked pork chops on a serving platter, spoon gravy over the top. Serve. 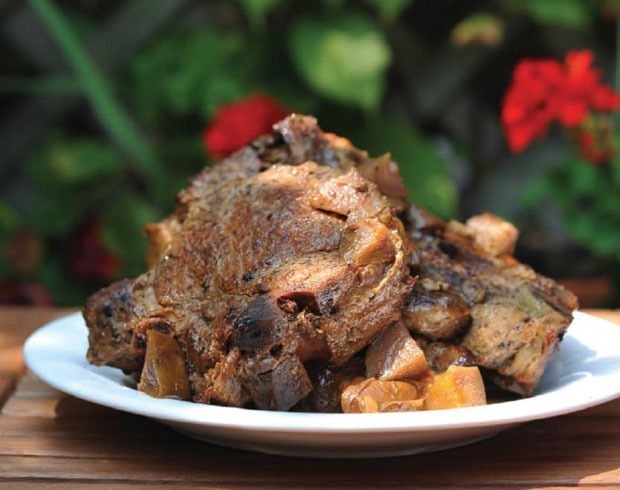 Instead of infusing intensity for your taste buds, apple cider amps up the porkiness while making the meat extra tender. 1. In a saucepan over medium heat, combine 2 cups apple cider, salt, brown sugar, garlic, 4 thyme sprigs, and about a teaspoon of cracked black pepper. Bring to a simmer, and allow the salt and sugar to dissolve. Let cool completely. 2. 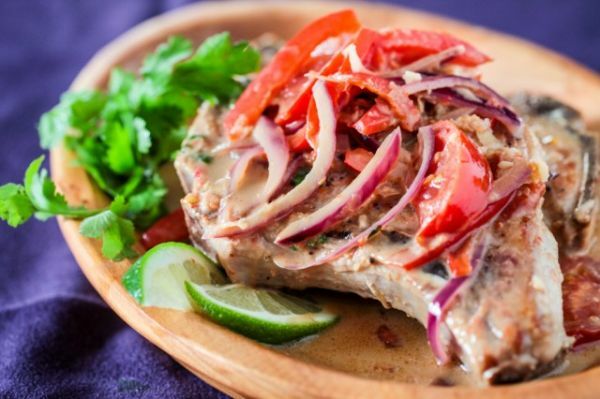 Place pork chops in a shallow container with a lid. Pour the brine over the top. Cover and refrigerate for at least an hour, up to 24 hours. 3. When ready to cook, preheat the oven to 200°F. Remove the pork chops from the brine and pat them dry. Heat a heavy pan over high heat. When hot, add the oil. When the oil is sizzling, add the pork chops – but don’t let them touch the pan. 4. Reduce the heat to medium. Cook for 5 minutes, or until the bottom is nicely browned. Then flip to cook for another 5 minutes, or until the center is no longer pink (internal temperature at least 150°F). Transfer the chops to the preheated oven to keep warm. 5. Pour off any fat, and return the pan to the stove. Melt the butter, and sauté the shallot until softened, 1–2 minutes. Add the remaining cup of cider and thyme sprigs. Stir in cream. 6. 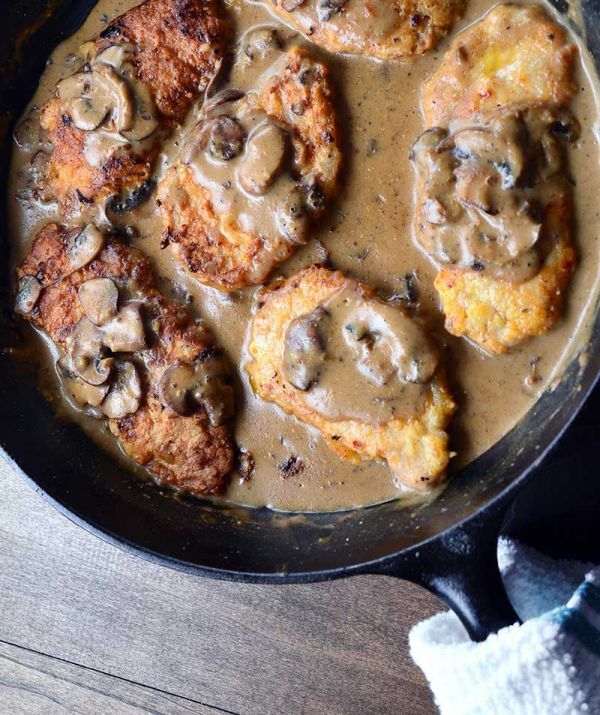 Serve pork chops with the pan sauce. Enjoy! Think pork chops have to be plain? Then you need to start thinking Thai. This dish has all the things you love about a classic green curry: lime, chili sauce, ginger, bell peppers, cilantro, and coconut milk. And with this recipe, you can make the sauce and the pork chops in one pan. 1. Season both sides of the pork chops with salt and pepper. 2. Prepare the sauce in a large bowl, whisking together the coconut milk, fish sauce, soy sauce, lime juice, chili sauce, and sugar until it’s smooth and creamy. 3. In a large sauté pan over high heat, add half the coconut oil, and swirl to coat the bottom of the pan. When the pan is very hot, add the pork chops to sear for a couple minutes. Flip, and sear for 2 minutes on the other side. Remove when the meat is about halfway cooked. Set aside. 4. Add the remaining coconut oil to the pan. Add onions, pepper, and tomatoes to sauté for about a minute. Add the garlic and ginger, cooking for another minute until the ingredients become fragrant. Pour the coconut milk mixture into the pan, and stir all to combine. Bring to a simmer, and then turn the heat to medium. 5. Nestle the half-cooked pork chops in the sauce. Cook for 2–3 minutes, or until the pork chops are coked just a shade of blush pink in the center. The sauce will thicken. Serve immediately, spooning sauce and vegetables over the pork chops. So you’ve been through all the seasoning mixes in the spice rack trying to reinvent pork chops, but what about digging in the dessert pantry? Pork chops with orange and molasses might sound too sweet. The result, however, is reminiscent of Chinese BBQ pork only with basil – in a word, delicious. 1. Place pork chops in a freezer bag with 1/2 of the orange juice, molasses, basil and a dash of salt and pepper. Shake well to evenly coat pork chops. Let marinate in the refrigerator for at least three hours. 2. When ready to cook, preheat the oven to 350°F. 3. Heat 1/2 tablespoon of olive oil in a cast iron skillet over medium heat. 4. While the skillet is heating, toss the sweet potatoes in a large bowl with remaining orange juice, olive oil, cinnamon, garlic, allspice, honey and a dash of salt and pepper. 5. When skillet is hot, throw in onions and sweet potatoes. Cook, stirring often, for 10–12 minutes, until softened. 6. 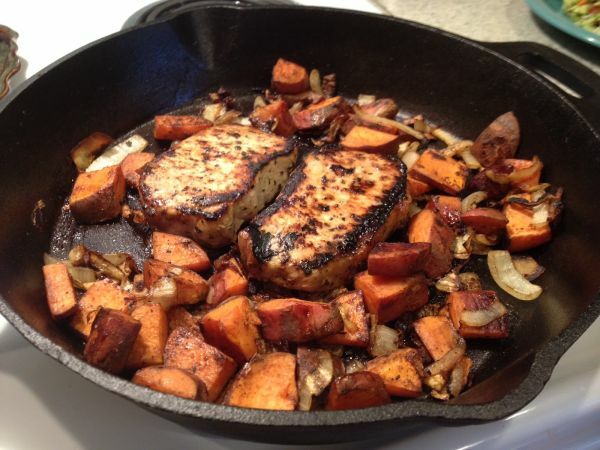 Clear a space by pushing the sweet potatoes and onions to the outer edge of the skillet and place the pork chops in the middle of the skillet. Sear the pork chops for about four minutes, flipping after two minutes, reserving the marinating juices in the bag. 7. Add the marinating juices to the skillet and carefully transfer the skillet to the preheated oven. Bake for 20 minutes, until vegetables are tender and pork chops are cooked through. Turkey isn’t the only meat that tastes good with preserved fruit. And although this recipe uses red currant jelly, you can try other types too, such as seedless raspberry or apricot. No matter what you choose, it’ll add just the right amount of sweetness to balance the salty pork chops and bite of hot sauce. These chops pair well with a simple side dish, like sautéed greens or carrots. 1. Using a whisk, combine red currant jelly, soy sauce, hot sauce, and crushed red pepper in a small bowl. 2. Place pork and 1/4 cup of the jelly mixture on a rimmed baking sheet; toss to coat. Cover, and let marinate in the refrigerator for an hour. Reserve remaining jelly mixture. 5. Steam carrots for 10 minutes, or until tender. Combine carrots, parsley, butter, and mustard in a bowl; toss to coat. Serve pork chops with carrots and reserved jelly mixture. Flavor isn’t the only thing that’s versatile about the pork chop; there are also a bunch of ways to cook it. Of course you can pan-sear it or roast it in the oven, but did you know you can also leave pork chops to get perfectly prepared in a slow cooker? 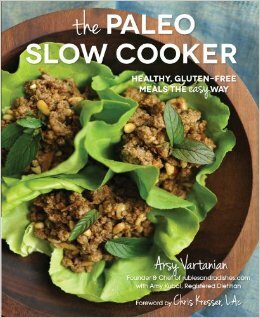 Find this and other quick meals in The Paleo Slow Cooker: Healthy, Gluten-Free Meals the Easy Way. 1. Melt a tablespoon of coconut oil in a heavy-bottomed pan over medium heat. 2. Brown the pork chops on both sides (in batches if necessary) for about 5 minutes total, and place in the slow cooker. 3. Sauté the pears and ginger in the remaining coconut oil. 4. Add the vinegar and wine, turn to medium-low, and cook for 5 minutes to reduce slightly. 5. Pour mixture over chops in the slow cooker. Add the honey, cinnamon, and allspice. 6. Leave to cook on low for 6 hours. Season with salt and pepper to taste, and serve. 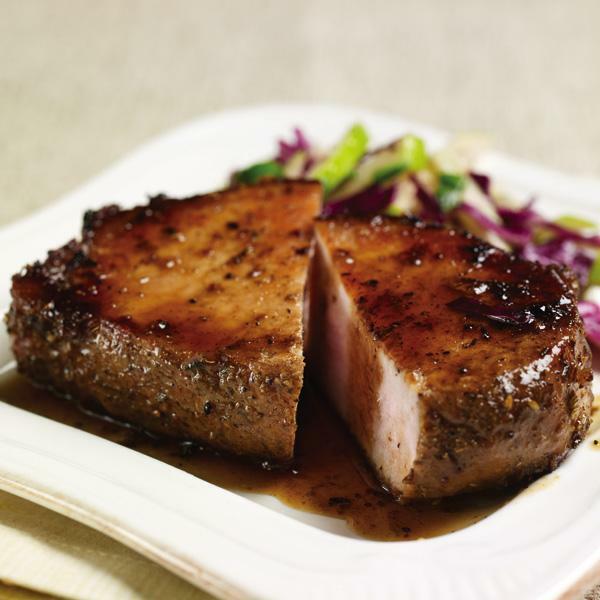 This preparation will work just as well on steak, but the milder flavor of pork allows the nuances in the sweet balsamic sauce to shine. Since the sauce is easily pureed in a food processor, you can definitely make this on a weeknight, but it’s also fancy enough to prepare for guests and special occasions. 1. In a large zippered plastic bag, mix together garlic, rosemary, lemon rind, thyme, lemon zest and oil. Season the pork chops on each side, add to plastic bag. Using your hands, smush the pork chops around so the marinade gets all over them. Let sit in fridge for at least an hour to absorb the flavors. 2. Purée the raisins, figs, balsamic vinegar, honey, olive oil and water until smooth. Strain through a fine-mesh sieve into a saucepan and season to taste with salt and pepper. Warm sauce, allowing it to reduce slightly before serving. 3. Grill the pork chops for 6-8 minutes on each side or until cooked (160°F medium). 4. Warm the raisin-fig-balsamic sauce over medium heat for 5 minutes or until heated through. Place a pork chop on the plates and top with the sauce. 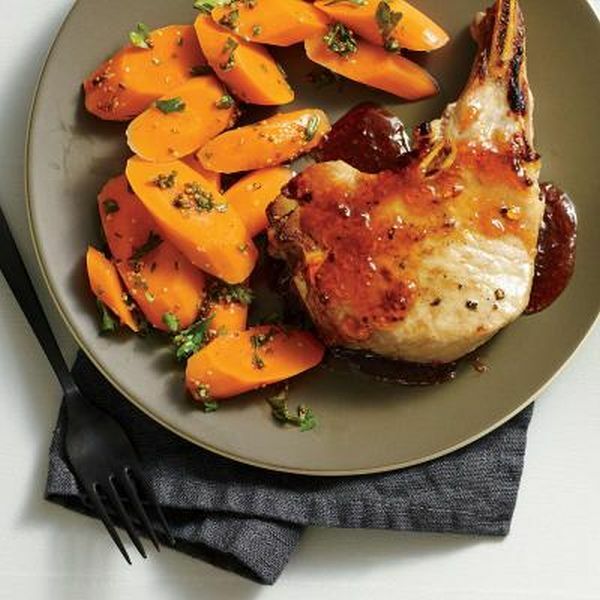 What did you think of these healthy pork chop recipes? Have anything else to share? Let me know in the comments below!